Tyler Junior College is accredited by the Southern Association of Colleges and Schools Commission on Colleges to award associate degrees. Contact SACSCOC at 1866 Southern Lane, Decatur, Georgia 30033-4097, telephone 404-679-4500 or at http://www.sacscoc.org for questions about the accreditation of Tyler Junior College. General inquiries about Tyler Junior College admission requirements, financial aid, educational programs or other offerings should be directed to the College and not the Commission. Tyler Junior College gives equal consideration to all applicants for admission, employment and participation in its programs and activities without regard to race, color, religion, national origin, gender, gender identity, gender expression, sexual orientation, age, marital status, disability, veteran status or limited English proficiency (LEP). Tyler Junior College respects the legal rights of each person to work and learn in an environment that is free from unlawful sexual discrimination including sexual harassment and sexual violence. 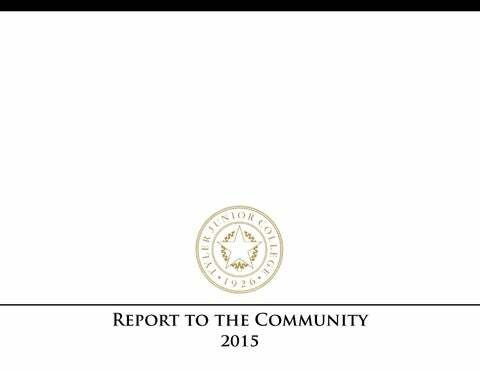 The 2015 Report to the Community reflects activity from September 1, 2014 through August 31, 2015, which is both the 2014 - 2015 academic year and the 2015 fiscal year. We refer to this as our reporting year. Except where otherwise noted, all references made are in reference to the reporting year. To be the regionâ&#x20AC;&#x2122;s premier comprehensive community college, recognized internationally for its academic and workforce programs, student life and community engagement. president’s MESSAGE The year 2015 was perhaps the College’s most notable since the year of its founding in 1926.
double the size of the only faith-based residence hall operated on a Texas community college campus. We opened three new buildings: the Robert M. Rogers Nursing and Health Sciences Center on our Main campus (which is the largest facility in our history); the new Energy Center on our West Campus; and Crossroads, our newest residence hall. In 2016, we will celebrate our 90th anniversary in style, and we have some exciting things planned. I hope you enjoy reading about the accomplishments of 2015. We look forward to seeing you at one of our anniversary celebration events later this year! We launched several new programs, including physical therapy assistant, dental assisting, polysomnography, community health worker, healthcare administration, wellness & exercise and multimedia production & marketing. We also received approval from the Texas Legislature to offer our first Bachelor of Science degree, in dental hygiene. TJC was the only community college to gain this approval among the many that sought the opportunity to provide a bachelor’s degree. Many thanks go out to Senator Kevin Eltife and Representative Travis Clardy for introducing the legislation that led to the new degree program. Applications to the Southern Association of Colleges and Schools and the Texas Higher Education Coordinating Board have already been submitted to start the program in the fall of 2016. Overview of tjc’s strategic goals In 2015, the college formalized its five-year Strategic Plan, which includes goals through 2019. Building on goals from the previous year and some early successes, the Vision 2020 plan focuses on three key areas: Student Success, Partnerships and Continuous Improvement. All numbers based on Fall 2014 unless otherwise noted. THE MISSION OF TYLER JUNIOR COLLEGE COMES TO LIFE THROUGH OUR COMMITMENT TO OUR STUDENTS. TJC has been delivering on our mission to students and the Tyler area for nearly 90 years by providing a quality education, a vibrant student life and service to the community. We call these our three promises to students. With more than 45 associate degree options and 35 certificate options, along with superb academic programs, TJC is known for quality instruction, caring faculty and support services designed to help students achieve goals like no other college at the two-year level. Here are just a few examples of how we are keeping these promises. TJC offers rigorous courses and programs for transferable college credit, classes designed for immediate entry into the workforce, and courses for career preparation, enhancement and personal interest. Satellite locations provide the opportunity to take classes remotely. Courses are offered in traditional and non-traditional settings, including online, hybrid and in some cases, on-site. Our Concurrent Enrollment program allows students in high school to receive college credit that also provides high school credit. TJC participated in and was recognized for student involvement in the national “My Two Cents Day” event, building awareness of the U.S. national debt and its effect on the future. The student who came the closest to predicting what the national debt would be on the U.S. Debt Clock at exactly 5 p.m. won $100. Students from many sections of U.S. History, Federal Government, and Micro & Macro Economics participated and learned many valuable lessons about the U.S. economy. TJC’s Art Club participated in canned food drives in the fall and spring, benefiting the local Tyler CARES Food Pantry and collecting over 1,000 food items each semester. The Art Club also hosted a silent art auction during TJC’s Festival of the Arts, raising more than $1,000 for the Art Club, to go toward purchasing materials, supplies and providing scholarships for students. Signifying a commitment to student success and institutional improvement, Tyler Junior College joined the Achieving the Dream: Community Colleges Count initiative in 2010. Achieving the Dream identifies strategies to improve student success, close achievement gaps and increase retention, persistence, and completion rates. It is a multiyear, national initiative to help more community college students succeed. The initiative is particularly concerned about student groups that traditionally have faced significant barriers to success, including students of color and low-income students. Too many students leave community colleges without earning a certificate or degree, or without transferring to continue their studies. Consequently, they risk losing the opportunity to earn a livable wage. When students complete courses and earn credentials, however, they can improve their own lives, which ultimately benefits the nation. Achieving the Dream aims to bring about change within community colleges and in state and federal policy. The initiative also seeks to augment knowledge about strategies that increase student success and to expand public support for raising postsecondary attainment levels. At its core, the initiative seeks to help more students reach their individual goals, which may include earning a community college certificate or degree, attaining a bachelor’s degree, and/or obtaining a better job. Achieving the Dream colleges will maintain a high degree of access for historically underrepresented groups while working to increase the percentage of students who accomplish the following: • successfully complete the courses they take; • advance from remedial to credit-bearing courses; • enroll in and successfully complete gatekeeper courses; • enroll from one semester to the next; • earn degrees and/or certificates. Cole took the tournament by storm, with Jacob and Skyler winning first place in several categories and qualifying for the national tournament competition. The Law Enforcement Academy conducted two classes in this reporting period, with a total of 24 cadets. Each class qualified for their state licensing exam and all cadets passed on their first attempt, earning Basic Peace Officer Certificates. Over the last ten years, the academy has maintained a 100% cadet record for passing on their first attempt. Participating in more than ten community service projects, the Alpha Omicron chapter of Phi Theta Kappa was named to the Top Ten chapters in Texas, out of 88 chapters, and was ranked in the top 25 internationally, out of 1,300 chapters. Chapter officers were recognized as one of 30 Distinguished Officer Teams internationally, and Michael Strait, Vice President of Service, was named one of 25 Distinguished Chapter Officers. Student Mikenna Denton was named one of twenty Coca-Cola Gold Scholars nationwide and students Kaitlin Lenoir and Sabrah Shipman were named Coca-Cola Leaders of Promise Scholars. Chris Fisher was also named a Terry Foundation Scholar. Communication and Media students swept the competition at their annual state conference, winning 39 awards and taking top honors in their division for the studentled newspaper, The Apache Pow Wow. Students won Best of Show for Division 3, First Place for Overall Excellence for Newspaper Division 4 and Sweepstakes for Newspaper Division 4 during the Texas Intercollegiate Press Association (TIPA) conference in San Antonio. Forty-seven schools and more than 520 delegates attended the conference. Award winners included Haley Huston, Cory McCoy, Favian Quezada, Nathan Wright, Kati Fitzpatrick, Diego Reyes, Brett Burks, Brian Rhoads, Kevin Ramos, Colby Morgan, Bianca DeLeon and Bennet Levine. Allen were named to the all-region team. The men’s soccer team finished with a 21-3 record, and were the region, district, and national champions. In the National Tournament, they defeated Monroe College (NY) 2-1. The women’s soccer team finished with a 16-2-1 record and Coach Corey Rose was elected as President of the NJCAA Women’s Soccer Coaches Association. Women’s softball completed their inaugural season with a record of 39-18, finishing 3rd in Region XIV East. Six athletes were recognized for All-conference and Allregion awards including Halie Vance as first team all-region pitcher and Co-MVP of conference. Two members were recognized for the NFCA All-American Scholar awards—Amber Landry and Haley Mills. The team maintained a 3.31 team GPA collectively for the season. Both the TJC men’s and women’s tennis teams finished the year as National Runnerup. The TJC women’s tennis team was named the NJCAA Women’s Tennis Academic Team of the Year. Their cumulative GPA of 3.72 was the highest in the country. The volleyball team finished with a 36-7 record. While they fell in the Region XIV Tournament final to the eventual national champion Blinn Buccaneers, the squad earned a berth in the National Tournament for the third straight year. Apache Cheer placed 2nd overall in a division of nine teams at the National Cheerleaders Association Collegiate National Championship in Daytona Beach, Florida. They expanded to two teams, bringing in a total of 54 student athletes between the traditional Large Coed team and the newly established All-girl team. RECOGNIZING OUR STUDENT ATHLETES, CONT. ACCOMPLISHMENTS FROM AROUND THE CAMPUS The Testing Services department was awarded Test Center Certification by the National College Testing Association (NCTA). Criteria for certification are rigorous and are based on the NCTA Professional Testing Standards and Guidelines. The department is one of the few test centers in the U.S. and Canada to have completed this intensive certification process. This certification indicates that Testing Services adheres to the highest of test administration standards and is committed to providing excellent service to a wide variety of students and community members. TJC’s Emergency Medical Services Professions (EMSP) program partnered with East Texas Medical Center’s (EMTC) Emergency Medical Services (EMS) to advance the academic program for Emergency Medical Technicians (EMTs) and Paramedics. Led by the office of Academic Affairs, TJC and the Tyler Independent School District signed a partnership agreement to offer an Early College High School for Tyler ISD students. These students may earn up to two years of college credit while still in high school. Tyler Junior College and the University of Texas at Tyler announced the creation of a formal Patriot Pathways program to assist students with transfer between the two institutions. TJC and UT Tyler faculty worked collaboratively to establish transfer guides that allow students to complete an associate degree at TJC and a baccalaureate degree at UT Tyler as efficiently as possible. The TJC Alpha Omicron Chapter of Phi Theta Kappa International Honor Society was recognized at the International Convention as one of only three Continued Excellence Chapters. This award is presented to chapters that achieve Top 25 ranking, internationally, for three consecutive years. Career Services hosted the first STEAM Career Day, bringing in 17 members of the community to serve as panelists working in the fields of Science, Technology, Engineering, Arts, and Mathematics. The panelists represented 14 different companies and the panels focused on careers in science and technology, engineering and math, the medical field and the arts. Students had the opportunity to speak with highly respected leaders working in their fields of interest and learn about the importance of these jobs in the future. EXCELLENCE EMPLOYEES MAKE TJC AN EVEN BETTER PLACE TO WORK BY ACCOMPLISHING GREAT THINGS TOGETHER! Our faculty and staff really do make the difference. With more than 600 employees, TJC is proud of the commitment and passion that the Apache Nation displays. In fact, with more than 1,000 combined years of service, TJCâ&#x20AC;&#x2122;s employees stand the test of time. faculty and staff AWARDS TJC ENDOWED CHAIR FOR TEACHING EXCELLENCE Through this unique program, professors nominate and reward their peers for demonstrating excellence as educators. Four TJC professors distinguished themselves as endowed teaching chairs for 2015. Awardees receive cash gifts of $4,000, which includes a professional development stipend. This meaningful award is generously funded by donors, who are recognized in the naming of the Endowed Chair. FACULTY AND STAFF ACCOMPLISHMENTS In an effort led by Professor Stephanie Lassanske, the Social Work department crafted an articulation agreement between TJC and Stephen F. Austin State University, allowing students majoring in Social Work to take all but one class for their Bachelors in Social Work at TJC. Art Professor Dave Funk was appointed Honors Program director and Art Professor Philana Pace was appointed Wise Auditorium art gallery director. Lauren Tyler, director of student life at TJC, served on the Texas state executive board as state advisor elect, and then state advisor for TJC student government association. Jan Adams, director of academic advising, was appointed to the 2015-2017, National WEB Advisory Board for NACADA, the Global Community for Academic Advising. The board develops all NACADA webinars to provide professional development to academic advisors at Colleges and Universities worldwide. Professor of Nursing Jodi Seal earned the designation of Certified Nurse Educator through a certification process developed and administered by the National League of Nursing. Athletic Director Tim Drain was named as an Under Armour Athletic Director of the Year. He also served as the President for the National Alliance of Two-Year College Athletic Administrators (NATYCAA). TJC Baseball Coach Doug Wren was named the ABCA/ Diamond Sports Company NJCAA D3 National Coach of the Year. Laura Jett Krantz, department chair of Communications & Student Media and student newspaper adviser was named president of the Texas Intercollegiate Press Association. Creative Writing Professor Traci Borum, a published author, released her most recent novel Painting the Moon and English Professor Tina Bausinger released Cold Coffee and Speed Limits. alumni president’s MESSAGE Dear Alumni, It’s a privilege to serve as the president of the Tyler Junior College Alumni Association Board of Directors. The Board of Directors is an outstanding group of members who have service hearts and are fully engaged in supporting TJC. Our goals are to encourage participation in the educational, cultural, athletic and social programs of the College; to communicate the qualities of Tyler Junior College to the public; to recruit quality students for Tyler Junior College; and to assist the College in achieving its planned goals and objectives. The fall semester flew by as our association hosted new events and continued many treasured traditions to reconnect classmates and faculty. Thanks to our members and board for their participation in these great events including Football Tailgates, Homecoming, Alumni Awards Dinner, Fuel for Finals and Graduation. the standard rate of $200! The new Fuel for Finals event was a huge success! The Alumni Association connected with current students to provide homemade cookies, coffee and hot chocolate to ensure they had the fuel needed to successfully complete final exams. to seeing you at our upcoming events! alumni association tyler junior college Numbers represent activity between September 2014 and August 2015. THE TYLER JUNIOR COLLEGE ALUMNI ASSOCIATION PRESENTED THESE AWARDS AT THE 2014 HOMECOMING AWARDS CEREMONY IN OCTOBER. author, Johns has three novels available on Amazon: Thirteenth Apostle, Return to Heroism, and Garden of the Okapi. Johns’ mother, Annie Hill, attended TJC in its infancy years and is credited with suggesting the Apache mascot during a student assembly in 1928. Literacy Council of Tyler (LCOT) Apache Spirit Award Recognizing a person or group who has shown great spirit and motivation towards a program or activity that measurably benefits TJC. The Literacy Council of Tyler has partnered with TJC since 2001, when the LCOT office moved into donated space on the TJC West Campus. The partnership has grown over the past decade to include joint operation of the Family Learning Center of Tyler (FLCOT) and the establishment of the Intensive College Readiness program. The FLCOT combines TJC’s early childhood program with a working childcare center and literacy and English fluency programs. Tyler ISD provides space for the FLCOT, which is located on the campus of Douglas Elementary. The Intensive College Readiness program is a Literacy Council/ TJC initiative that helps GED graduates transition successfully into college courses at TJC. Officials held a ribbon-cutting and grand opening ceremony for Crossroads Hall, TJC’s newest on-campus housing. A prime location on the west side of campus, residents will have an easy walk to the new Robert M. Rogers Nursing & Health Sciences Center and the rest of the main campus. The 4-floor hall will house 248 students – both freshmen and returning students. The $20 million, 63,000-square-foot residence hall will bring TJC’s on-campus population to about 1,300 students. Responding to feedback from student focus and advisory groups, Crossroads offers wireless Internet throughout the building, plenty of storage space, meeting and gathering spaces for social interaction, a Chick-Fil-A restaurant, outlets to recharge technology and even a mobile app that students can download to determine when washing machines are available in the laundry room. • Physical Therapist Assistant Program earned “Candidate for Accreditation” status from Commission on Accreditation in Physical Therapy Education. classrooms that allow students to receive training on new, advanced equipment. The Center offers its own dental clinic on the first floor, where anyone can request to be placed on a waiting list for dental cleanings, oral examinations and X-rays. Services are provided by dental hygiene students under the supervision of a general dentist and registered dental hygienists. HGR+Turner Joint Venture served as the construction manager and the lead architectural firm for the project was ROBERT M. ROGERS NURSING & HEALTH SCIENCES CENTER What was once a dusty, corner lot occupied by a gas station, a pharmacy and a restaurant is now a 155,000-square-foot, stateof-the-art training ground for future nurses, dental hygienists, sonographers, radiologic technologists and a host of other health care professionals. SmithGroupJJR, who joined with four local firms in the building’s development and design: Eubanks Harris Roberts Craig Architects, Fitzpatrick Architects, Brannon Corporation and David C. Scarbrough Landscape Architecture. • The inaugural class of the Level 1 College Credit Certificate in Dental Assisting was admitted in the fall. • Through a cooperative partnership agreement with UT Health Northeast, a new Community Health Worker Level 1 Certificate was approved by THECB and SACS-COC. • An Advanced Technical Certificate in Polysomnography enrolled its first class of students in the spring. • Radiologic Technology Program achieved 100% pass rate on the national board examination by The American Registry of Radiologic Technologists. • The Occupational Therapist Assistant Program launched in the fall with a class of 23. • After a site visit in the spring, the Surgical Technology Program received full affirmation of accreditation for ten years, with no reporting requirements. • TJC was granted approval by the State Legislature to initiate a proposed Bachelor of Science Degree in Dental Hygiene. For more information on the Robert M. Rogers Nursing & Health Sciences Center, go to www.tjcnursing.com. THE STATEMENT OF NET ASSETS PRESENTS THE ASSETS AND LIABILITIES OF THE COLLEGE AT THE END OF THE 2015 FISCAL YEAR. PLEASE VISIT WWW.TJC.EDU FOR A FULL, AUDITED REPORT. Tyler Junior College foundation Chairman’s message For nearly ninety years, Tyler Junior College has been the choice for thousands of students pursuing an affordable, quality and stimulating two-year college experience. The same can be said today. I know I speak for my fellow board members when I tell you how much keeping that tradition alive means to all of us. Because of the great financial support we receive from the community, and generous supporters, we are able to continue to build best-in-class higher education opportunities for students who choose TJC. Providing a comprehensive, affordable college experience is our primary goal, and guides our promises to students. Through helping the College award more than $3.6 million in scholarships during 2014-15, to funding teaching chairs and providing academic and student life program support; the Tyler Junior College Foundation is at the heart of these promises. The Foundation staff, along with the board, are committed to helping TJC meet the needs of our student population. We take our role as stewards seriously. We know that without our supporters, none of this would be possible. This year alone, we received more than $3.4 million in gifts from more than 650 individuals, foundations and corporations. Eleanor Stringer is a community volunteer dedicating countless hours through her service on various boards and charities through the years. She also volunteered her time to visit places like Belize to help with medical and dental care. foundation REPORT WHAT WE SUPPORT The Tyler Junior College Foundation is an independent 501(c) 3 nonprofit that exists to support Tyler Junior College. 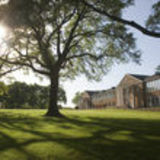 Our mission is to enhance the overall reputation of the College, to provide resources to fund college priorities and create opportunities for the College to build partnerships with alumni, friends, donors, corporations and foundations. Our staff is committed to helping the college fulfill our three promises to students and we do this through fundraising initiatives that support scholarships, programs and activities. Over 90% of Foundation dollars support scholarships for students. It is our primary focus and allows us to respond to the needs of many worthy students each year. In fact, in this reporting period alone, the Foundation awarded more than $1.4 million in scholarships to eligible students enrolled at Tyler Junior College. This funding, along with support from the College and state, provides more than $3.6 million in financial aid to students who attend TJC. At the center of this foundational support are endowments. Like many other colleges, endowment resources help us retain the best faculty, attract the best and brightest students and provide the most responsive programming to meet the needs of our students. There are a number of ways to establish an endowment through the Tyler Junior College Foundation. Scholarship Endowments are the most common and focus on providing scholarship funding in perpetuity. Established by Barbara Shtofman in loving memory of her late husband, Norman. Sherilyn and Patrick were very special to Norman and Mrs. Shtofman knew it would thrill him to have the scholarship named in their honor. The Willis’ both attended TJC. Dr. Willis is a well-respected obstetrician and gynecologist in Tyler and Patrick serves as president and CEO of Abegg Willis & Associates, also in Tyler. Foundation in establishing the Robert M. Rogers Nursing & Health Sciences Center,” TJC President Dr. Mike Metke said. “This generous gift is an investment in the future of East Texas health care and in TJC’s mission to become a health care training destination. “When a gift of this magnitude comes along, it reminds us of the awesome responsibility we have to live up to that gift by keeping our promises to help our students reach their fullest potential.” Thank you to all of our supporters for helping make the vision of the Nursing and Health Sciences Center a reality for East Texas! Tyler Junior College is truly grateful to the Robert M. Rogers Foundation and the many contributors for their generous support. • This list recognizes leadership gifts to the Center. Special thanks to all of our donors for their generosity. Permanent donor recognition displayed in lobby of Rogers Nursing & Health Sciences Center. THE FOLLOWING INDIVIDUALS MADE GIFTS DURING CALENDAR YEAR 2015. PRESIDENT’S CIRCLE MEMBERS ARE INDICATED IN BRONZE. Unfortunately, we are unable to list all donors in this publication. Please visit www.tjc.edu/annual report for a full list of contributors.